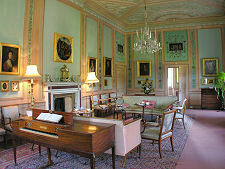 Paxton House lies just four miles west of Berwick-upon-Tweed on the north bank of the River Tweed. The centre of the river forms the border between Scotland and England at this point, so Paxton House lies within Scotland by just the width of its gardens and half the width of the Tweed itself. 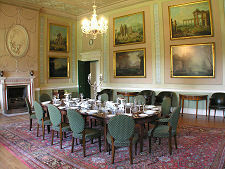 Today's visitors to Paxton House can enjoy one of the regular guided tours of the house. 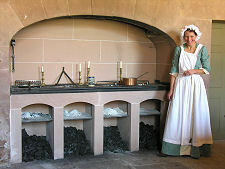 These start in the remarkable Old Kitchen complete with its restored and working charcoal stoves, before moving through the house itself. 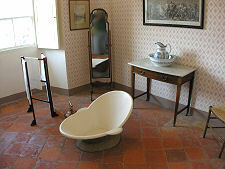 The highlight is its remarkable collection of Chippendale furniture. It is also very interesting to see how the feel and scale of the house changes as you move from the main block through to the 1814 east wing, complete with the impressive Bust Room and Library, and the simply staggering Picture Gallery. And for children there are teddy bears to spot in their hiding places around the house. Your tour ends back in the original east wing, once the stables. Here you find the stables tea room and the shop. Paxton also has impressive gardens surrounding a croquet lawn at the rear of the main house, an adventure playground, and woodland walks that include a path alongside the River Tweed to the boathouse, home to a museum of salmon net fishing. Paxton House's story begins, arguably, with the Reverend Ninian Home. He came into possession of the Paxton Estate by means of a series of complex legal moves that won it back from government confiscation after the Jacobite uprising of 1715. He then gave it to Sir George Home, the distant relative from whom it had been confiscated because of his part in the uprising; and he then married Sir George's eldest daughter Margaret, who was 30 years younger than himself. Ninian died in 1744, at the age of 74, leaving his widow, Margaret, running their estates and looking after their six children, the eldest of whom was Patrick, aged just 16 at the time of his father's death. The young Patrick was sent by his mother to study in Leipzig, and two years later he became part of Frederick the Great's Court in Berlin. In 1750, at the age of 22, he fell in love with 18 year old Sophie de Brandt, Lady in Waiting to Queen Elizabeth Christina of Prussia. 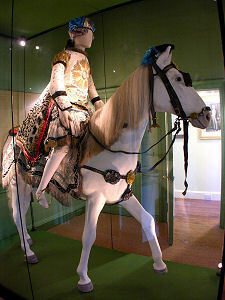 On 25 August 1750 Patrick took part in the Berlin Carousel, a vast annual pageant, riding alongside Frederick the Great's brother dressed as a Carthaginian knight. This incident is of interest because, uniquely, Patrick's costume eventually found its way into a trunk at Paxton where it lay undisturbed for 250 years. It is now on display in the house. Frederick the Great approved the proposed marriage between Patrick and Sophie on condition Patrick moved permanently to Prussia. But Patrick's mother Margaret threatened to disinherit him, and insisted he set off instead on a Grand Tour of Italy, which in January 1751 he did. Patrick was en route back to Prussia and Sophie in late 1751 when news reached him that his mother had been murdered by the butler in one of the family houses. As a result he had to return to Scotland to take over the estate and attend the trial without being able to see Sophie again. By 1755 Patrick had conceived the idea of building a fine house on the Paxton Estate to which he could bring Sophie, and he agreed plans with the architect John Adam in 1757. Work began in March 1758 under the supervision of James Nisbet, a master mason from Kelso, and the finishing touches to the last part of the exterior structure, the portico above the main door, were made in 1763. But by then it was clear that his dream of marriage to Sophie was dead: she and Patrick never met again again after their parting in Berlin in early 1751. 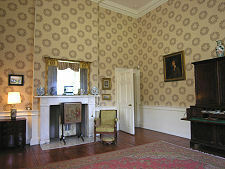 Patrick lost interest in Paxton House and it remained undecorated and possibly internally unfinished. 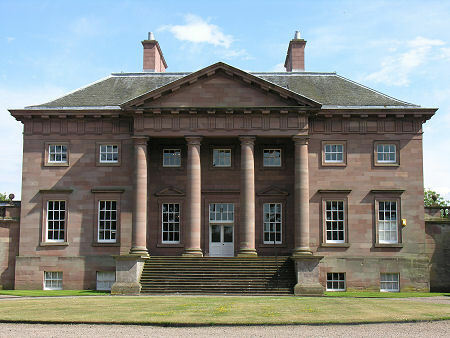 In 1766 Patrick Home inherited the nearby estate of Wedderburn Castle, and in 1771 began to build a new house there, this time to house himself and his proposed Scottish bride, Jane Graham of Dougalstone. 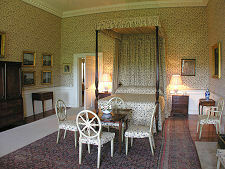 Jane was never to live at Wedderburn, but that's another story. 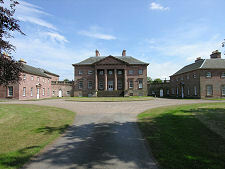 In 1773 Patrick Home sold the unfinished Paxton House to his cousin, Ninian Home, for £15,000. Ninian had made his fortune from his sugar plantations in Grenada and wanted Paxton as somewhere to base himself when visiting Scotland. He had no time to oversee the fitting out and decoration of the house himself, so contracted the company of Chippendale, Haig & Co. to do everything for him. 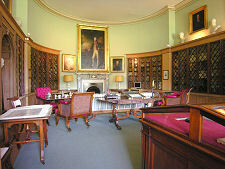 This they did, leaving Paxton House with one of the most spectacular collections of Chippendale furniture anywhere. 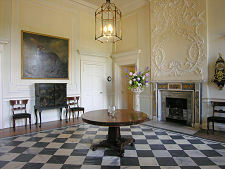 In 1795, Ninian was killed in a slaves' uprising in Grenada, and Paxton House passed to his younger brother George, who also inherited Wedderburn Castle in 1812 following the death of Patrick Home. 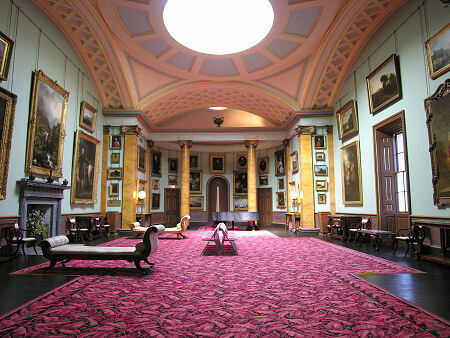 George asked Edinburgh architect George Reid to design a new east wing behind the existing stables intended to to hold a library and a picture gallery to accommodate the books and paintings from both houses. This was finished in 1814, and George Home devoted himself to cataloguing the books, paintings and furniture in the house: work that has allowed the remarkable recreation you see today. 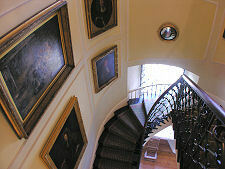 Paxton House passed between different branches of the Home family through the 1800s before being inherited by Helen Margaret Milne Home in 1918. 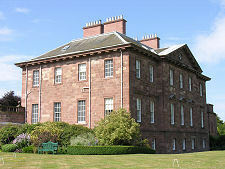 Her son, John Home Robinson, Member of the Scottish Parliament for East Lothian, presented the house and estate to the Paxton Trust in 1988. They have since restored it to what you see today, a grand house built on a fairly intimate scale (except for the picture gallery) giving an excellent impression of how its residents would have lived in the early 1800s. Half a mile to the south is the unique Union Chain Bridge across the River Tweed. 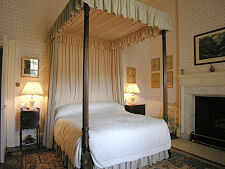 Paxton House, Berwick upon Tweed, TD15 1SZ.